The highest performance in welding of steel, stainless steel and Aluminum! 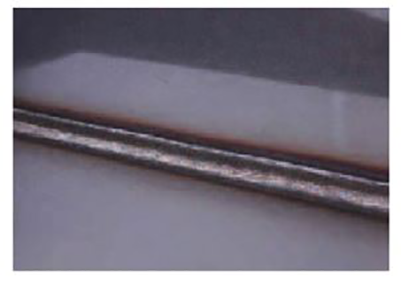 Pulse welding is a type of metal transfer in which a high current (peak current) and a low current (base current) are applied at intervals to break away a single droplet formed at the tip of the wire by the electromagnetic pinch force generated by the pulse current. 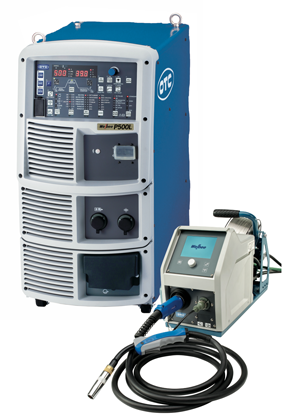 The Welbee inverter series offers the following strong points by utilizing an optimum waveform control according to welding materials. You can realize an arc with minimized spatter generation, from low current to a high current range. You can realize excellent welding results even for surface-treated steel materials including galvanized steel. 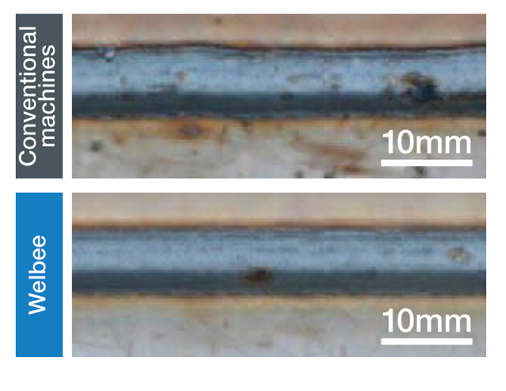 You can increase the deposition rate and easily secure the desired bead width even at high-speed welding. Even in the case of a strong occurrence of zinc vapor during welding of galvanized steel, an optimized new intelligent filter will enable you to perform a stable welding. 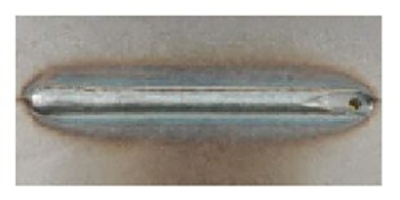 In addition, you can easily realize an even bead with a uniform end. Even in blow hole prone materials such as galvanized steel, vibrating the molten wave pool using the wave pulse welding method dramatically reduces the occurrence of blow holes. 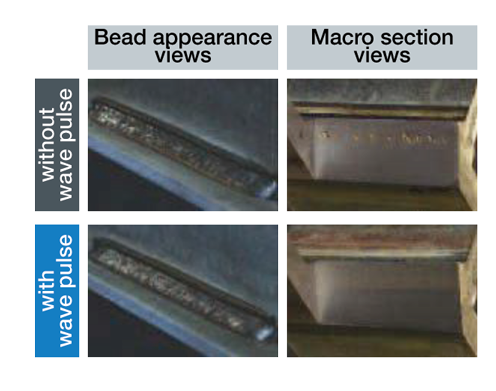 You can obtain a good bead even at high-speed welding of stainless steel, do to the pulse wave-form control that is exclusive for stainless steels an is uniquely developed by DAIHEN. It can safely realize droplet transfer even for a highly viscous stainless steel wire. 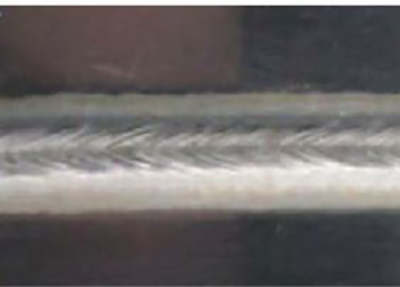 In addition, you can easily create a beautiful bead appearance with modulation equivalent to that of TIG welding by controlling the arc length and the wire feeding speed using wave pulse welding method. 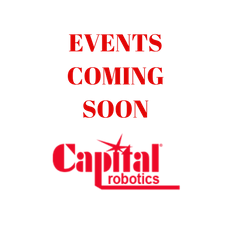 In combination with Robots of OTC’s FD series, you can optimize the performance of Welbee. You can carry out a high-speed pulse welding by setting parameters automatically interlocking with the speed information specified from the teaching pendant. 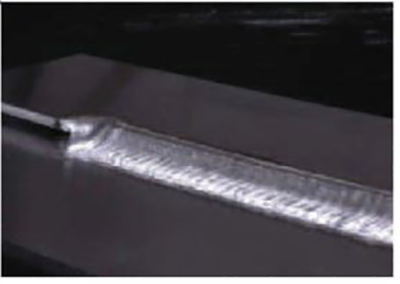 You can obtain a good bead even at high speed welding of stainless steel, do to the pulse wave-form control that is exclusive for stainless steels an is uniquely developed by DAIHEN. It can safely realize droplet transfer even for a highly viscous stainless steel wire.